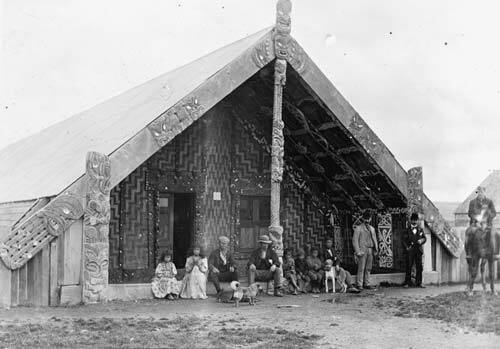 The meeting house Ngā Tau e Waru at Te Ore Ore marae, seen here in the late 19th century, was built by the prophet and leader Pāora Te Pōtangaroa and opened in 1881. Soon after, Pāora unveiled a flag predicting the loss of Māori land. Images on the flag symbolised residual Māori land holdings and Pāora’s prophecy that ‘I will swim the ocean to ask the Queen about the evils of the land’. Many people thought the prediction was fulfilled in 1897 when tribal leader Hoani Tunuiārangi and other Māori went to England for Queen Victoria’s diamond jubilee. Tunuiārangi presented the British government with a Māori ‘bill of rights’, which was referred to the New Zealand government. Every 40 years, hui (meetings) have been held to debate and renew Pāora’s covenant – the last was in 2001. In 1939 Ngā Tau e Waru burnt down, and was replaced by a new meeting house of the same name.